‘Our Sky’ consists of a 4’x8’ concrete landscape sculpture showing mountains, a city and farm land. Emerging from the mountains are long strips of scrap metal suspending concrete cast planes. Adjacent to this landscape is a CPU fan connected to an Arduino board. 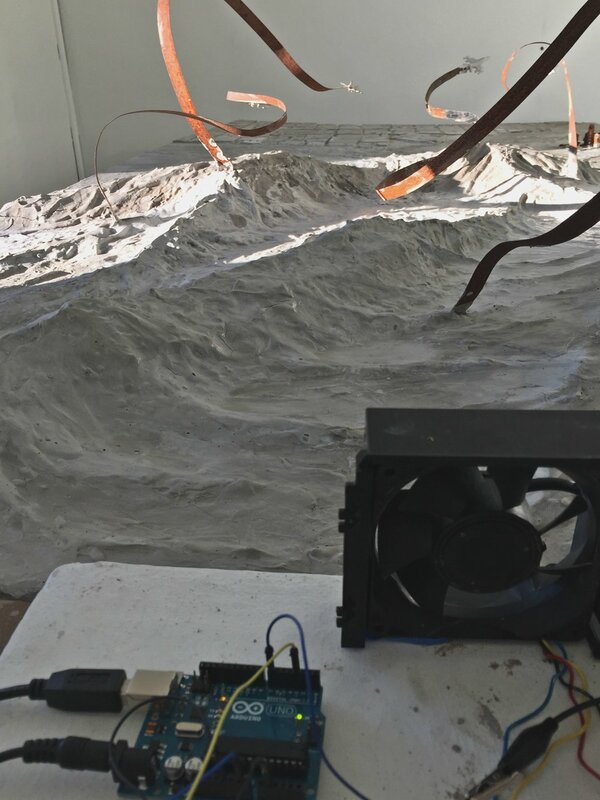 A Java Script program tells the Arduino to turn on/off the CPU fan, activating the sculpture upon the presence of aircraft within an 3.5 km radius. In Turkey and the United States, planes and jets are used as displays of military power and symbolically represent the impact of capitalism in our increasingly globalized world. By revealing the constant presence of aircraft in real-time, an opportunity to reflect and discuss themes surrounding social interconnectivity, environmental responsibility, aerial warfare and food security. Many thanks to my collaborator Jesse Francis for the programming support and to Faucet Media Arts Center.